System assigns a unique parts_id to each part imported or group created. Duplicates are not allowed and duplicate check is done on partnumber. 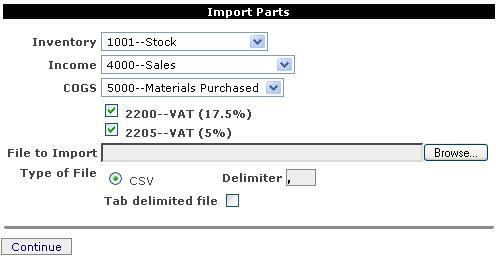 To start the import process, click ‘Data Import–Parts’ in the menu. Following page will be displayed. Click ‘Browse’ to select your CSV file, mark the taxes applicable and select the account links (Defaults are enough most of the time) Click ‘Continue’ when done. You will be presented with the following screen. On this screen you can mark the parts to be imported by checking or un-checking the checkbox on each line. 2. Parts groups which are new will be added. These are marked by a ‘+’ sign after group name. Copyright © Ledger123.com 2019. WordPress theme by Ryan Hellyer.